We'll begin the week with some chilly weather, but we'll end the week with much warmer temperatures. We&apos;ve been saying it for a while here at First Warning Weather... "pretty soon, it&apos;ll start feeling like Spring around here more consistently." Well, we&apos;ll definitely be moving in the right direction this week! We&apos;ll begin the week with some chilly weather, but we&apos;ll end the week with much warmer temperatures. Let&apos;s dig right in! High pressure will begin to strengthen on Monday afternoon, and it&apos;ll be hovering over our region all the way through the end of the week. What does that mean? Well, if you&apos;ve been reading my former posts, you&apos;ll know that High Pressure is a good indicator for Happy Weather! It&apos;s an easy way to remember it. High pressure allows the air way above our heads to sink to the surface, which causes clear conditions. 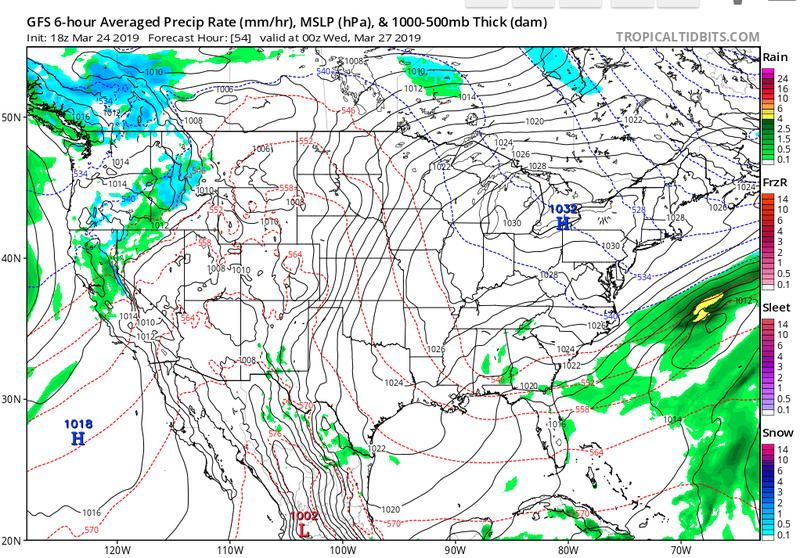 Notice on the picture below (courtesy of tropicaltidbits.com), which is valid at 0Z Wednesday (translating to Tuesday afternoon local time), high pressure is sitting directly over Northwest Pennsylvania. Expect clear, sunny conditions on Tuesday and Wednesday! Temperatures will even climb into the upper 40&apos;s and 50&apos;s on Wednesday and Thursday, and it&apos;ll last right through the weekend. 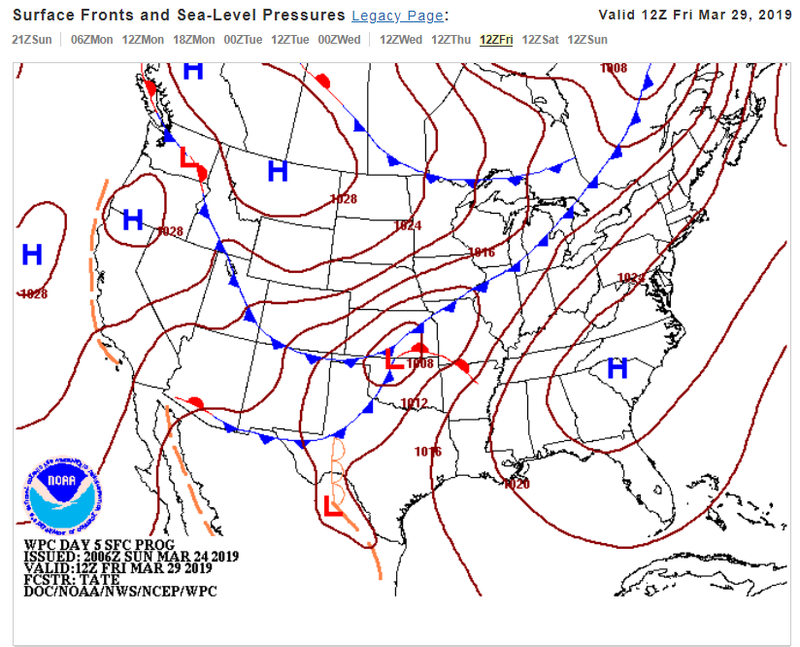 On Thursday, high pressure will begin to slide off to the East and low pressure will begin to move into our region. 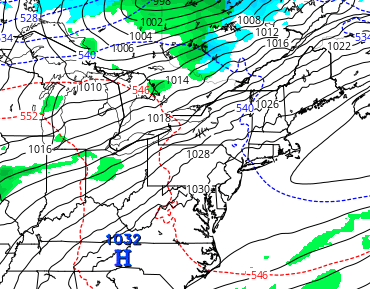 Notice how the isobar contours (black lines) are so close together on Thursday. That translates to a tight pressure gradient, which means that Thursday will likely be a breezy day. Tight pressure gradients cause winds to increase, which will be the case Thursday and Friday as we anticipate the arrival of some rain showers. On Friday and Saturday, a cold front will begin to approach from the west. It&apos;ll slow down, and possibly stall out, as it nears our region on Friday afternoon. Because of this, showers are in the forecast beginning on Friday and lasting all the way through Sunday. Depending on how fast the cold front pushes to the East, we may be looking at some clearing for Saturday and Sunday, but we&apos;ll have to wait and see. In the weather world, timing is everything, so we&apos;ll have to see how things evolve as next weekend draws near! On a positive note... this is the last full week of March! April is right around the corner, which means May is "on-deck", which means June and July are not too far away... you get the picture! Summer is closer than you think. You can always follow me on Facebook and Twitter @joeyswx, and let me know if you have questions about the upcoming week!